Here's your home version of the fun-filled Exidy arcade game! 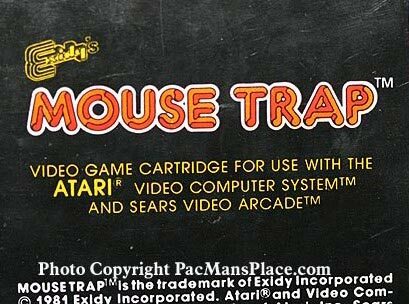 MOUSE TRApTM for AtarjCRJ features a cheese-chomping mouse that you dash around a dangerous maze. Open and shut maze doors to escape the pursuing cats. Eat a bone, then turn your mouse into a cat-biting dog for a few moments. Gather points by eating the cheeses that line the paths of the maze. Devour them all and move on to even harder action!